Dartmouth's Hood Museum Acquires a Very Special "Suitcase"
The Hood Museum of Art at Dartmouth College has just acquired one of them. Taylor notes that all 300 valises are still extant, to scholars’ knowledge; though some are in private hands, most are in museums. “For an edition of that size, you’d think they would be ubiquitous, but they’re not,” he says. The Hood’s valise is on view through August 26, after which it will be put away until a display with softer and less damaging illumination can be created as part of an upcoming museum expansion. That sensibility, and his use of replication and appropriation, set the artistic stage for future generations of artists. “The Flux people loved the Box,” says Taylor, referring to a DIY, anticommercial movement in the 1960s. He points out that the Hood owns a “very large collection of Fluxus,” including so-called Fluxkits. These are boxes containing, for example, printed cards, games, ideas and miscellany. 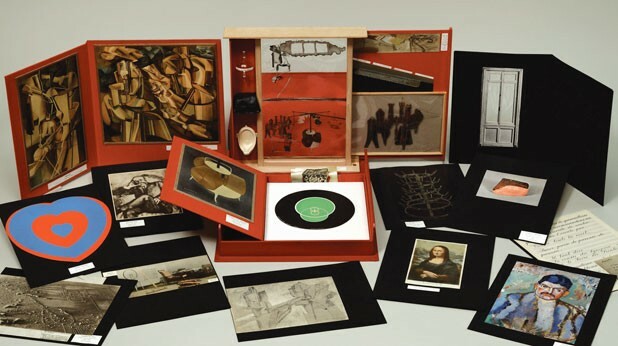 Speaking of boxes, it’s worth noting that one of Duchamp’s assistants for creating his “Boîte” editions was Joseph Cornell, now considered a pioneer of assemblage. The Hood’s valise joins a previous Duchamp acquisition: an edition of “The White Box,” which “is filled with notes related to ‘The Large Glass,’ a painting [aka ‘The Bride Stripped Bare by Her Bachelors, Even’] about nine feet tall, in Philadelphia,” says Taylor. In a collection of 70,000 items, Duchamp’s contributions are sure to stand out — even in miniature. “Art in a Box: Marcel Duchamp and the Expanding Grid,” a discussion-based workshop, on Wednesday, April 18, 6:30-8:30 p.m., second-floor galleries; register by April 16 at 603-646-1469. Special tour of “Boîte-en-valise” with Michael R. Taylor on Saturday, April 28, 2 p.m.